In my previous article, Fireworks vs Photoshop Image Compression, I’ve concluded that Fireworks is better for image optimization. But if you want to further cut down the bytes, try Yahoo Smush.it. I did a quick test. 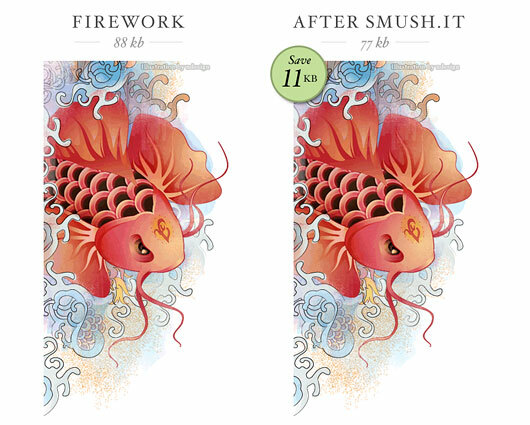 I uploaded an image that was optimized by Fireworks and then Smush.it. The smushed image is 11kb less. Go try it yourself! Thanks to Darcy (@darcy_clarke) for suggesting this tool. I’ve been using it to optimize my images for a bit now and I love it. Every byte counts for sure! Oh No it’s gone. Internet changes faster than you can blink.